The Milwaukee 11 Amp Deep Cut AC/DC Band Saw with Case has a powerful 11 Amp motor with Constant Power Technology (CPT) for maximum performance to tackle your toughest applications. Comfortable to use and easy to control with a balanced body design, lighter weight and slimmer motor housing for better cut visibility, this tool is not lacking in cut capacity with the versatility to cut up to 5 inch x 5 inch material in a single pass. The tool-free locking adjustable shoe lets you adjust from an extended shoe to no shoe in seconds and with the debris protection system, debris is removed during operation. Built-to-last with durability features, including Job Site Armor Technology, all-metal direct drive and a gear protecting clutch, this versatile saw is ideal for use in the field, in your workshop or for DIY projects around your home. 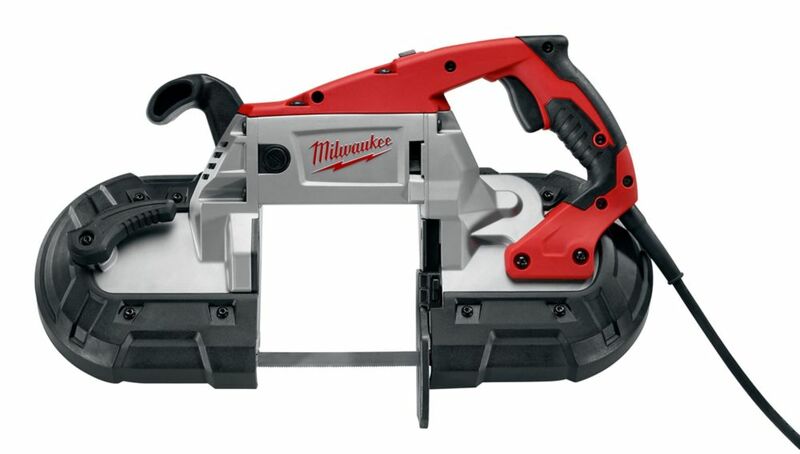 11 Amp Corded Deep Cut AC/DC Band Saw With Case The Milwaukee 11 Amp Deep Cut AC/DC Band Saw with Case has a powerful 11 Amp motor with Constant Power Technology (CPT) for maximum performance to tackle your toughest applications. Comfortable to use and easy to control with a balanced body design, lighter weight and slimmer motor housing for better cut visibility, this tool is not lacking in cut capacity with the versatility to cut up to 5 inch x 5 inch material in a single pass. The tool-free locking adjustable shoe lets you adjust from an extended shoe to no shoe in seconds and with the debris protection system, debris is removed during operation. Built-to-last with durability features, including Job Site Armor Technology, all-metal direct drive and a gear protecting clutch, this versatile saw is ideal for use in the field, in your workshop or for DIY projects around your home. 11 Amp Corded Deep Cut AC/DC Band Saw With Case is rated 4.6 out of 5 by 10. Rated 5 out of 5 by Tech126 from Go to saw One of the best purchases I've made, this saw has quickly become my go to saw in the field due to its power and portability. I really like it's built in LED work light and speed control. A great addition to the gang box. Rated 5 out of 5 by RDTech from Works very well. Works very well. Rated 5 out of 5 by Blueboy1 from Great portaband Works great.....What I needed....$60.00 cheaper than other stores. Rated 5 out of 5 by CatMachines from Quality product Only complaint is that it is only a two speed saw not a variable speed.